There have been many books written on shooting from Hit the White Part by my friend Massad Ayoob to Gila Hayes Concealed Carry for Women. The first step is to study and define your goals. For most of us personal defense is most important. Next, get started by taking the NRA beginner’s course. Safety is stressed and you will have a solid foundation for growth as a shooter. Like everyone else there are times when I am just shooting for fun. Not often, but occasionally, I break out the .22 TCM or a long barrel single-action revolver and just see if I can hit the rock on the one hundred yard berm or alternately see how quickly I can hit a tennis ball on the ten yard line. It is all great fun. 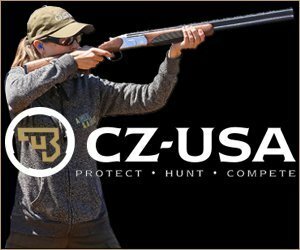 But if you are serious about growth and need to learn defensive, competitive or hunting skills then the time spent on the range should be productive. How much time you spend just shooting and how much practicing should be examined. All of the time and money spent on guns and ammunition should be a payoff in marksmanship. I recently had a good discussion with a real athlete of a shooter and a person firing many thousands of rounds on a yearly basis. The only way to attain such goals is to practice dry fire diligently and fire until you get it right, which is more often than not. 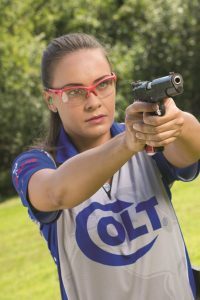 Shooters like Maggie Reese and Jessie Duff don’t just shoot more than I and better than I―they practice the right way and follow strict rules concerning practice. Most shooters improve quickly given the proper mindset. They go from having difficulty controlling their shots to what they think is good shooting. If they do not have other shooters to gauge their accuracy by, they often have an overinflated idea of their own skills. A few rounds of IDPA competition will put things in perspective. It is tempting to get pretty good and then empty the pistol into the target. Machine gunning a paper target is fun but it isn’t viable training and you do not learn much. Unless you are properly executing the Bill Drill you need to learn marksmanship first. That means slow fire precision. Accuracy is final. Noise and brass in the air is fun sometimes, but you must hit the target. Unfortunately some shooters begin with a handgun that will destroy their confidence. I know a fellow that actually purchased his wife a compact Kimber .45 for their wedding anniversary as her first gun. A hard-kicking single-action .45 isn’t something most folks relish firing at the range. We do it because we must to master a carry gun. I have lost track of the compact .357 SIG and .40 Smith & Wesson self-loaders that resulted in a terrible flinch shooters picked up before attending my class. Their results were poor. A big brawny guy showed up with a Springfield XD in .357 SIG and his wife, who had never fired a gun before my class, had an identical Springfield in 9mm caliber. You guessed it―this guy barely passed the class and scared everyone on the line with blast and flash. I am certain he practiced trigger jerk not trigger press. His wife, on the other hand, rose to the occasion and passed the class with a 90% score―far above her spouse’s 75%! The .38 Special revolver in a four-inch barrel handgun and a medium size 9mm self-loader are ideal for personal defense for beginners and not too bad for the most experienced shooter. The .357 SIG. 40 Smith & Wesson and .357 Magnum cartridges require much time and effort to master. They should be left to shooters that have trained extensively and understand recoil control. 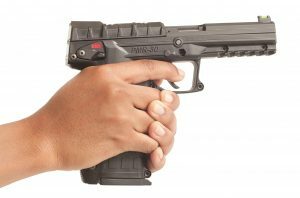 I most often carry a .45 caliber self-loader and it has more of a push than a harp rap, and with a steel frame pistol or something over 30 ounces, the .45 is a reasonable choice. But once you develop flinch it is very difficult to get rid of this involuntary muscle contraction. An equally poor choice is a pistol that is too small. 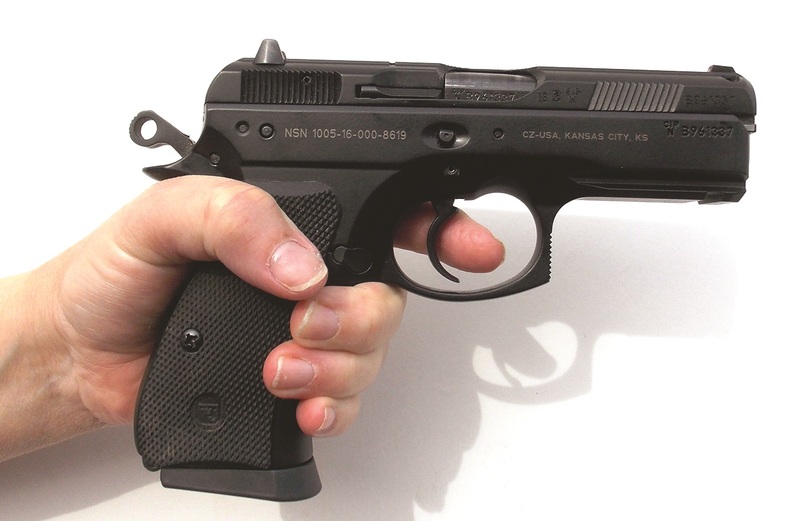 Small sub-compact handguns have small grips that cramp the hand. The controls are difficult to manipulate efficiently. Shooter induced malfunctions in which the shooter allows her hand and fingers to strike the controls are common with these handguns. A short sight radius is also a limiting factor. 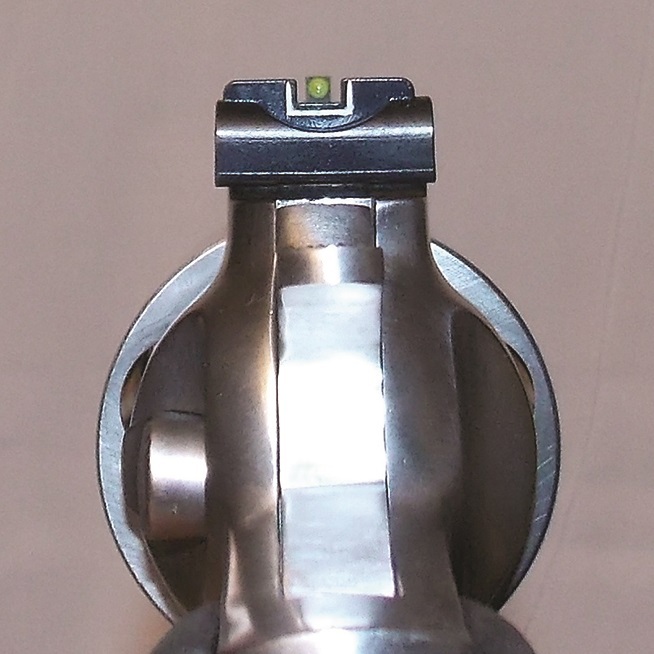 Pulling a heavy trigger against a light handgun isn’t conducive to good accuracy. While it is good to begin with a .22, in the ideal situation many are interested in personal defense shooting and can only afford one handgun. That is the one they practice with. Repetition and delivering a certain performance on demand means that you have to have mental discipline. This means firing the handgun time after time in exactly the same manner with the same trigger press and the same sight picture and sight alignment time after time. You may be moving or the target may be at different ranges but the chore is the same. Line the sights properly. Superimpose the sights properly over the target. Press the trigger to the rear smoothly. Keep the grip strong in follow through, allow the trigger to reset, and fire again. If you fire a double tap at 5 yards or fire a five-shot group from the bench rest at 25 yards the process is the same, the details differ. I often see folks at the range that are using a very poor stance. They are holding the pistol incorrectly, too weakly, and their feet are not planted correctly. When I work into a stance I have a mental trick that helps a great deal. I imagine a steel rod anchoring me to the earth and running at least twenty feet into the ground. I may pivot on it or turn in any direction but that rod running from my leg through the earth is my anchor. I keep a rock solid stance. I often hear folks at the range emptying their gun. Five shots, a .38 snub, six booms, a .357 Magnum, eight or nine deep blasts, a .45, and the inevitable 13 to 18 rounds from the 9mm, often followed by a fast reload and a repeat. I just don’t think they are learning much even if they are having fun. As I said ammunition is expensive and you should be getting your money’s worth. A solid hit in the X ring beats fifty rounds all around the x in my opinion. Groups do not save your life. You need to practice often and have the image of a perfect sight picture firmly implanted in your hard drive memory. My practice regimen works well for me since I test a lot of handguns. I fire for reliability and combat shooting at 5, 7 and 10 yards with five controlled shots per group. The ten yard range is important, I think, as it is far enough to stress the need for good marksmanship habits but close enough to avoid frustration as the beginner practices. The handgun must be properly sighted. As an example, just last week I tested an expensive factory handgun that fired four inches to the left in relation to the point of aim at 20 yards. I am confident in my skill and managed to properly adjust the sights. (I keep an extensive range kit with proper tools.) A combination of speed, accuracy and power is needed. This accuracy isn’t easy to build without careful attention to the basics of marksmanship. Speeding up simply means you will miss faster. Shooters that do not have enough time to practice do the best they can. A job, a family and other obligations loom larger for some that others. Just the same the time you manage to devote to training should be utilized properly. If you have achieved a high level of skill, then you may practice a number of skills in each range session. The draw, presenting the handgun to the target, firing accurately and even weak hand fire and barricade shooting may be pressed into the range time. This isn’t ideal. I think that shooters are often duplicating their qualification exercises. There are drills such as the El Presidente that include several skills. It isn’t difficult to incorporate speed loads into every practice session. But when working to build skills you need to specifically build that skill. Work with short range control during the entire session, or long range and hitting small targets, depending upon which skill you are short at. Perhaps weak hand fire is your shortcoming. Work with the non-dominant hand during the range session. 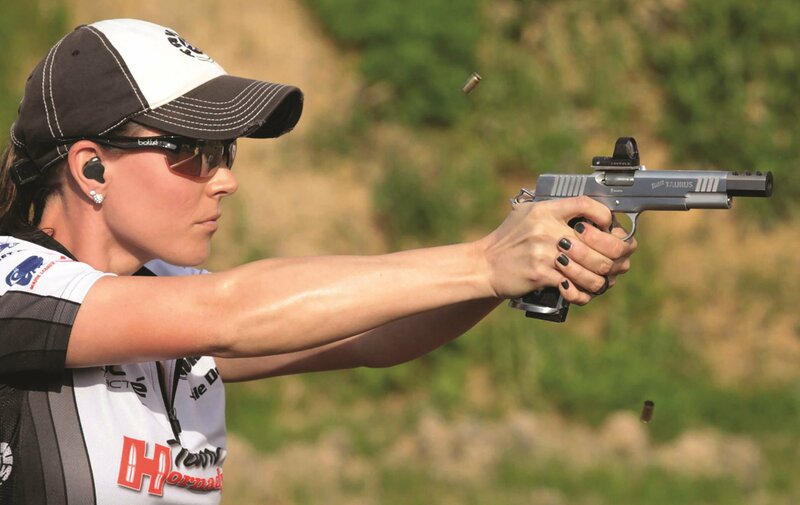 It takes a lot of practice to become reasonably good at combat pistol drills. Practice hard on the skills you have not mastered. It is easy enough to go to the range and practice the drills you are good at. It takes that thing called mental discipline to master the other drills. This process is often called learning to learn. Once you have learned the practice and attention to detail that goes into mastering a skill you will be prepared for other skill building exercises and approach each the same way.